Frank Hanavan interviewed on the street. Frank Hanavan interviewed one year later. ﻿Frank Hanavan was born in 1964 he grew up in Kenmore, NY (a suburb of Buffalo, New York). In 1990 he packed up his paints, easel and brushes and moved to New York City. He began painting scenes of everyday city life. Winter, Spring, Summer, and Fall, rain, snow or shine, one can find him out and about painting. Twenty years and about a thousand paintings later Frank is still setting up his portable easel directly before his subject matter and painting from life without editorializing or romanticizing the subjects. He often says his real subject matter is the quality of light falling on the subject, not the physical subject itself. Frank attended and studied art The Chicago Art Institute, and the University of Buffalo. However, He credits the three summer sessions he attended The Chautauqua Institution for most of his real knowledge of painting and drawing. Chautauqua is an oasis where realism, traditional drawing and painting skills are still appreciated and taught. Frank never fails to mention the wonderful education he received at The Chautauqua Institute where it changed his life. Over the years Frank has had many one man and group shows in New York, New Jersey and Connecticut. Recently the Hoboken Historical Museum had a retrospective of his work; Frank Hanavan Painting The Town. 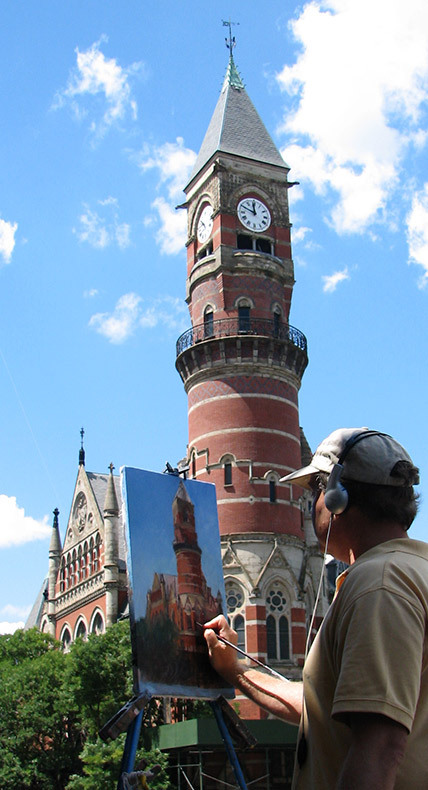 The show consisted of his original historically accurate paintings depicting Hoboken during the two decades. Interestingly, all the paintings were borrowed from his many loyal patrons. Frank has many hobbies including historically accurate ship model building, and his volunteering at the South Street Seaports Full Rigged Ship The Wavertree, and the Schooner Pioneer. He is a self taught sailor and a vivacious reader of historic sailing ships and great sea captains.